Yesterday afternoon I received the email with the subject line “PASS Summit 2018 – Your Session Evaluations are Ready!” As someone who strives to give my best when presenting at this event, the evaluations are important to help me see where I might improve. First, 38 responses out of 145 attendees is quite good. I’m thankful for that. Yes, I’d love to see more people submit evaluations, but this is much appreciated. Second, an overall score of 4.50 out of 5 is something I’m very happy about. When you factor in the variety of factors that can leave people less than satisfied, many times having nothing whatever to do with your session content or quality, this score is quite good. 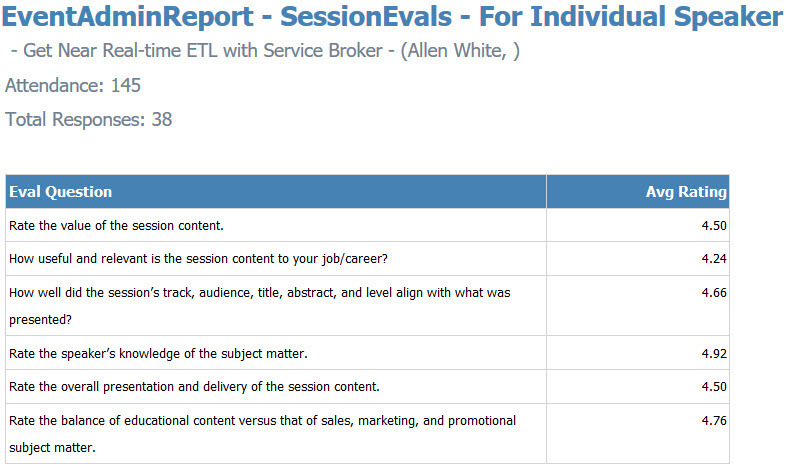 The lowest of these ratings is 4.24, having to do with the relevancy of the content to the attendees’ jobs or careers. Again, this is not surprising. I was discussing asynchronous messaging as an ETL tool. An operational DBA will probably never need this solution. The highest of these ratings is 4.92, based on the speaker’s knowledge of the subject matter. I’m happy with this, though I feel there’s still so much more for me to learn about Service Broker and its wide variety of use cases. Some of the comments I received really did make me smile. Overall good class. It did a few times seem to get sidetracked with questions (i.e. too many were taken), but the subject matter was covered well. I had worked with Service Broker several years ago, and this was a nice refresher – not only reminding me of the value, but also some of the gotchas, with workarounds presented to handle some of those. The speaker was clearly an expert on the subject and very informative. Great demos and good introduction to service broker. I think I already have a use case for what I learned. Thank you! There were some that contradicted each other, like this one. Very enthusiastic delivery of content and subject matter speaker knew well. As opposed to this one. Very knowledgeable speaker, but rather bland presentation. Did not take questions very well. One even forgot my name. But I think my favorite was this next one. Really appreciated his encouraging comments before the talk, being personally as valuable as the tech talk itself. The last comment is the one I appreciate the most. Before I give any talk I encourage everyone in the room to consider sharing their knowledge by putting together a presentation on a topic that interests them. It helps build their confidence, allows them to learn more about their topic, and allows us to learn about what interests them. It’s how we build our community and make it constantly grow and get better. I’ve been sharing those comments with people for over ten years, and will continue to do so. The SQL Server community is the only technical community I know that encourages each other to share and learn from each other. I’m extremely thankful, this Thanksgiving week, for the people in the community that continue to make the PASS Summit and other events so warm and welcoming, and for giving us all a chance to grow. Emergency – Are You Ready for Disaster to Strike?